Lamenting how judicial infrastructure has been given relatively low importance with infrastructure in courts in interior parts of the country being on ventilator, the Supreme Court on Thursday underlined some vital features which have to provide in all court complexes across India including court managers with MBA degree for ensuring efficient court administration in every judicial district. "Professionally qualified court managers, preferably with an MBA degree, must also be appointed to render assistance in performing the court administration. The said post of Court managers must be created in each judicial district for assisting Principal District and Sessions Judges. Such Court Managers would enable the District Judges to devote more time to their core work, that is, judicial functions. This, in turn, would enhance the efficiency of the District Judicial System. These court managers would also help in identifying the weaknesses in the court management systems and recommending workable steps under the supervision of their respective judges for rectifying the same. The services of any person already working as a Court Manager in any district should be regularised by the State Government as we are of the considered view that their assistance is needed for a proper administrative set up in a Court". A bench of Chief Justice Dipak Misra, Justice A M Khanwilkar and Justice D Y Chandrachud said, “…judicial infrastructure which has been given relatively low importance, if not long neglected. That needs an overhaul. Apart from the metropolitan cities and State capitals, infrastructure in Courts, especially in the interior parts of the country, is dying out. It would not be wrong to say that some of them are just on the ventilator”. The bench was hearing an interlocutory application pertaining to infrastructure in court complexes especially in subordinate courts and noted that since its order passed in 2011 wherein it had asked various states why government land was not being made available for court buildings, a lot has been done but many aspects required immediate attention still. (i) Basic amenities such as adequate seating space for litigant public as well as lawyers, sufficient waiting area with seating arrangements, proper lighting and electricity, functional air-conditioning/air-cooling/ heating, accessible clean drinking water with Reverse Osmosis (RO) facility, clean and hygienic washrooms separate for men, women, transgenders and physically handicapped persons, kiosk and functional canteens selling beverages and eatables at nominal rates, preferably managed by court staff are some amenities and facilities which ought to be ensured at court complexes throughout the country. If these are missing in our court complexes, it would be an appalling situation which requires immediate rectification. (ii) We must further ensure that all our court complexes are conducive and friendly for the differently-abled and towards this end, the Court complexes must have certain features for the benefit of the vulnerable persons such as persons with disability or visually impaired persons. We have to move from disabled friendly buildings to workable and implementable differently abled friendly court infrastructure. Ramps for such categories of persons must be operable, feasible, tried and tested. Such ramps should definitely have steel railings and handles. The court infrastructure must also keep in view the accessibility for visually impaired persons and, therefore, court complexes must have tactile pavements and signage in braille for the benefit of visually impaired citizens. That apart, for ensuring easy movement of common citizens in the court complexes, there must be maps and floor plans of the entire court complex at entry and exit points and visible signage and directional arrows with colour coding throughout the court premises. (iii) For saving the litigant public and other citizens from running one end to the other without any guidance in the Court complexes and for assisting them to reach their desired place, it is necessary that all court premises must establish a working and fully operational help desk at major alighting points with trained court staff to brief and guide the citizens about the layout of the court premises. (iv) Court premises must also have a sufficient number of functional electronic case display systems for litigants and lawyers with the feature of automatic update in every ten seconds. (v) With the increase in motor vehicles, including cars and two-wheelers, it is imperative that court premises have sufficient and proper parking space to ease vehicular traffic and avoid crowding. All upcoming court complexes must have provision for both sufficient underground and surface parking facilities segregated into four broad categories – for judges, court staff, lawyers and litigants. As far as the existing court complexes are concerned, the possibility and feasibility of constructing underground or multi-level parking facilities must be explored. (vi) The court premises must have easy access at both entry and exit points. End to end connectivity of public transport systems must be ensured for court premises by starting feeder bus service and other dedicated transport services between major public transport points and court complexes. Access to justice will forever remain an illusory notion if access to courts is not ensured. (vii) Court premises must be armed with better crowd management arrangements along with adequate security measures. It has been seen, time and again, that at the time of court proceedings of cases which are well covered by the media, the crowd management in court premises runs into utter chaos. Measures must be taken to ensure that whenever court premises are thronged with heightened crowds, there is smooth ingress and egress of both vehicular traffic as well as citizens in the court premises. (viii) Creche facility at nominal rates for toddlers, falling within the age group of 6 months to 6 years, of lawyers, clerks of lawyers, bar association staff and officers and employees of court registry must also be constructed. The said creche facility must not be just for the namesake, it has to be both functional as well as effective with proper space and equipment such as baby proofing and other toddler-friendly provisions. That apart, the courts should have a proper atmosphere for children and vulnerable witnesses. (ix) Professionally qualified court managers, preferably with an MBA degree, must also be appointed to render assistance in performing the court administration. The said post of Court managers must be created in each judicial district for assisting Principal District and Sessions Judges. Such Court Managers would enable the District Judges to devote more time to their core work, that is, judicial functions. This, in turn, would enhance the efficiency of the District Judicial System. These court managers would also help in identifying the weaknesses in the court management systems and recommending workable steps under the supervision of their respective judges for rectifying the same. The services of any person already working as a Court Manager in any district should be regularised by the State Government as we are of the considered view that their assistance is needed for a proper administrative set up in a Court. (x) Adequate residential accommodation for judicial officers and court staff is another infrastructural aspect which requires immediate attention. The productivity of judicial officers and court staff who are not provided with residential quarters in and/or around the court premises gets negatively hampered. Thus, residential accommodation in proximity of court complexes for judicial officers and court staff must also be provided. (xi) There shall be solar power installation in each of the district court premises initially and thereafter, the same should spread to all other courts. (xii) Keeping in view the obtaining scenario, CCTV cameras should be placed at proper locations within the court complex. (xiii) To enhance the quality of speedy justice, video conferencing equipment and connectivity to jails shall be provided at the earliest. (xiv) The district court complex should have a dispensary with adequate medical staff and equipment. The bench has directed that its order be sent to the Chief Secretaries of each of the States by the Registry who will then constitute a committee also comprising the Secretary of the Department of Law to formulate the development plan as per the directions issued by the bench. This committee will invite an officer from the High Court to be nominated by the Chief Justice of the High Court and then present the status report to enable the court to pass further directions. Before passing the directions, the bench noted, “A sound infrastructure is the linchpin of a strong and stable judicial system. The responsibility for securing justice to the citizenry of our country rests upon the judiciary which makes it imperative upon the State to provide the judicial wing the requisite infrastructure commensurate with the constitutional obligation of the judiciary. It needs to be understood that without a robust infrastructure, the judiciary would not be able to function at its optimum level and, in turn, would fail to deliver the desired results”. 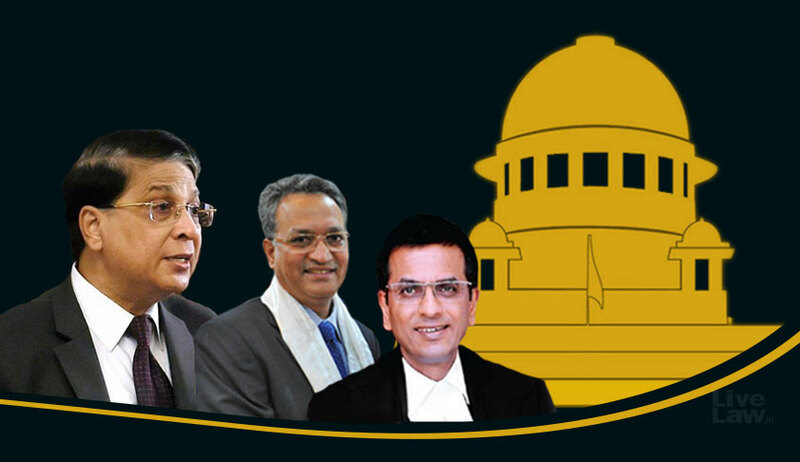 “It has to be firmly borne in mind and accepted as a reality that raising the infrastructure standards in the court complexes is the need of the hour as it is the basic requirement for the courts in the twenty-first century. We are absolutely clear that when people are aware of their rights, their desire to get the rights realised is enhanced and they would like to knock at the doors of the Court to shape their aspiration into reality. It is a welcome phenomenon and conceptually, Rule of Law ourishes and garners the said idea…infrastructure enhancement will go a long way in strengthening the functioning of the court and would improve the productivity in the justice delivery system”. The bench said “strengthening of court infrastructure requires immediate attention in the form of planning, enhanced budgeting and structured implementation or execution of the plans. Presently, most of the States are making budgetary provision as low as less than 1% of their total budget for the judiciary”. The bench also suggested a court development plan which it said should comprise three components - a short-term (or annual plan); a medium-term plan (or a five-year plan); and a long-term plan (ten-year plan). Courtrooms · Judges' chambers · Judges' residential complex · Litigants' waiting area · Administrative offices · Conference Hall/Meeting Room · Video conferencing rooms · Mediation centre/Legal Services Authority · Common rooms for male/female staff · Staff canteen · De-stress rooms for male /female staff · Office space for Government pleader/Public prosecutor/ Advocate General/Standing Counsel for Union of India with separate cubicles for conducting conferences and including space for accommodating their Secretarial staff and files · Support facilities like ramp, crèche, etc. FACILITY CENTRE providing for common facilities for functioning of the complex unrelated to courts such as bank, post office, medical facility, disaster management, etc. UTILITY BLOCK for accommodating the utility services such as A.C. plant, electrical sub-station, DG set/Solar panel, STP, Repair workshop, storage, garage, etc.